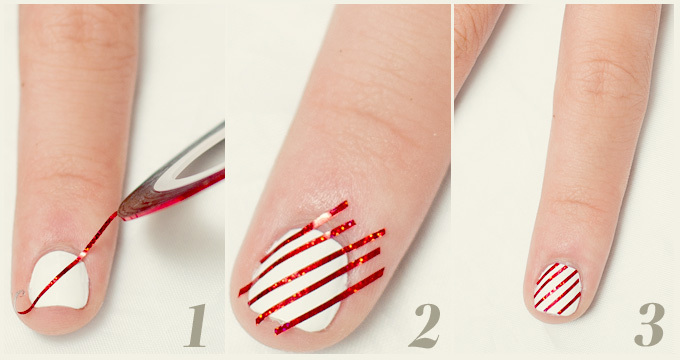 We're kicking off the holidays with this super easy Christmas nail art! It's just seven more days before the 25th, CGs—and we cannot contain our excitement here at the Cosmo HQ! So in the spirit of Christmas, we decided to devote five days of holiday-inspired nail art for y'all to try. So much fun, right? Today, we're kicking off with something pretty basic: Candy Cane nails. You'll need: white polish, a nipper, and nail stripping tape (which you can buy at Girl Stuff). Step 1. Paint your nails with white polish as a base. Once that dries, apply the stripping tape in a slanting position. We chose this sparkly red one because it's just so pretty to look at. Step 2. Use a nipper (not a pair of scissors) to cut the excess tape around your nails. You don't want to end up with a boo-boo. Step 3. Apply top coat as a finishing touch. Not only will it keep the tape from moving, it'll also add more sparkle and shine to your nails! BRB—doing this on our toes, too!